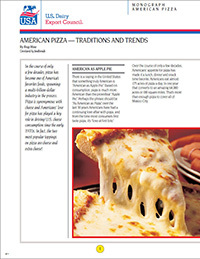 A 12-page monograph reviewing the history and trends in U.S. pizzas. Includes information on popular styles and trends, cheese blending for profit, cheese testing, and individual cheese profiles. Also available for free download in Arabic │Chinese (Traditional) │ Chinese (Simplified) │Japanese │ Korean │Spanish.